Phil Jackson noted after a recent practice how a series "can turn on a trifle." Seemingly little things can change the outcome of a basketball game; the roundball version of the butterfly effect, if you will. Saturday night we learned how events with absolutely zero subtlety can also change a game's direction. Like an incredibly stupid and juvenile flagrant foul by Sasha Vujacic on Goran Dragic. The fellow Slovenians are apparently feuding -- gotta love bad blood between Euro reserves -- and Dragic mouthed off after hitting a jumper over Vujacic at the top of the fourth quarter. "The Machine" reacted as any professional with a modicum of self control would: He "accidentally" hit Dragic in the chin while "raising his arms in the air." Dragic predictably flopped and the referees predictably bought it. Dragic canned his pair of freebies, and then hit Phoenix's next shot as well. What was suddenly a 15-point Lakers lead was quickly down to 11. What was once a dead U.S. Airways Center crowd was suddenly going bananas. Dragic and Amare Stoudemire then led a charge to get Phoenix to within five points with 5:36 remaining. A few more baskets were traded, then Steve Nash took a miss by Derek Fisher coast-to-coast and eventually waltzed through the lane for a layup. 2:18 on the clock. The Suns were within one of their trademark treys of knotting up what appeared a rout in the making. Lakers fans were nervous and Vujacic was about to enter a witness relocation program. Thankfully, he plays for the team with Kobe Bryant on the roster. Out of a timeout, Lamar Odom and Ron Artest passed the ball back and forth as Kobe fought Grant Hill to free himself up. The Dukie was backed down, then Kobe received the ball just as Channing Frye came with help. Then Bryant pulls up on a dime from 21-feet out and over a pair of hands. Money. The lead was back to five. On the next possession, Odom poked away a pass across the lane from Nash to Amare, and Kobe took the loose ball off to the races. Only Frye stood between the Mamba and the bucket. Kobe was fouled in continuation on a perfunctory reverse layup, then knocked down both free throws. The Lakers were now seven points ahead of Phoenix with less than two minutes to go. We're cleared for take off to the Finals. But Phoenix wouldn't quit. Stoudemire hit a running hook shot to draw the Suns closer. On the next possession, with seconds ticking down, Odom gave to Kobe, who backed down Hill along the sideline. Bryant spun to face up, then took a few dribbles to the right, Hill all over him like an ugly white suit from a failed photography experiment. Feet planted on the downtown arc, Kobe took the customary pump fakes, and then let fly. And you know how the movie ended. Net. Since the moment apparently didn't contain enough flair, after falling back towards the Phoenix sidelines, Kobe regained his balance, then gave Suns coach Alvin Gentry a slap on the backside. 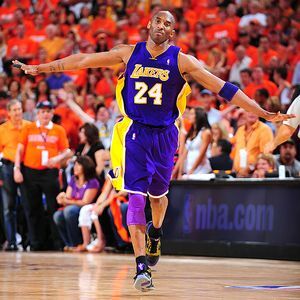 As I sat jawdropped trying to decide whether the shot to the bucket or to Gentry required more stones, Phoenix called timeout and Kobe did the "airplane" arms as he drifted back to the Laker bench, meeting Josh Powell for a flying chest bump. It was then 107-100 in the Lakers' favor with just 35 seconds remaining. Ballgame. For Bryant, this was the perfect capper for a series near perfect from start to finish. Coming into this contest, we had noted how Bryant wasn't just playing inspired basketball. He was playing out of his skull by his own high standards. 33 points per game on 53 percent shooting from the field and 44 percent success from behind the arc. Games 3-5 with 30+ points. Game 1 at the big 4-0. 9.6 assists. 7.4 rebounds. 1.4 blocks. Three straight games within screaming distance of a triple-double. Tonight provided the bookend for what has been a remarkable showing. 37 points (12-of-25 shooting, a trio of triples in eight tries). 10 free throws canned on 11 visits. Six rebounds. Two assists. Two steals. It's not only fitting he closed out the game in such decisive fashion. It is the only way things should have happened. In every way, shape and form, Kobe flat out earned that right. No word yet on whether Sasha flew home with the team or took a Greyhound on his own dime. While previewing tonight's game, Brian raised the question of Ron Artest being able to learn from mistakes made. His offensive rebound redemption to ensure a 103-101 Game 5 win came on the heels of a shooting brain cramp so bad, a Kevlar vest might have been needed to exit Staples Center. All's well that ends iconic, but given Ron's historic flightiness, there's always concerned about repeat offenses. Especially since he was so offended by Alvin Gentry's game plan of trying to bait him into "jacking up bad shots." That Artest was so put off by this "disrespect" -- which Phil Jackson labeled smart strategy-- hinted at perhaps a bad omen. Would Artest enter the game with too big a chip on his shoulder? Too eager to bury Phoenix in a sea of "I told you so" jumpers? I'm not in Phoenix with the team, so I can't speak authoritatively on the matter. But this much is certain. Artest launching shots is something the Suns have been willing to live with. Tonight, Artest launching shots was a large reason they're no longer alive. By the end of the opening quarter, Ron was already on the board with a dozen points on five-of-seven shooting. From inside, outside and mid-range, the man was on fire, leading all scorers in a high-octane first frame. By halftime there were 17 points, a trio of triples and two steals. The third quarter featured a sensational --and improbable, considering his earthbound game--double clutch scoop layup. The contest concluded with 25 points on 10-of-16 shooting, four rebounds, three steals, two assists and (I'm guessing) a "cat ate the canary" grin upon torching such a "dismissive" opponent. Interestingly enough, the night also included another highlight reel moment involving an offensive rebound, but some increased brain power. With 4:33 left in the first half, Kobe's attempt at a 22-foot bank shot came up dry, but Pau Gasol tapped the offensive rebound back for a new possession. The ball took another trip around the arc and eventually wound up in Kobe's hand, but his forced leaner while trying to draw a foul bricked. Artest secured the offensive rebound, and we've all seen what he can do in this situation. This time, however, no dice, as the layup is no good and Channing Frye nabbed the miss. But if at first you don't succeed, hound the crap out of Frye under the basket, then strip the ball from behind and lay the ball in. It wasn't quite Game 5's bedlam, but the Laker bench nonetheless went pretty nutty. Even more noteworthy was also a moment of controlled impulses. During the Lakers' final possession, Kobe drove towards the basket only to meet a wall of Suns cutting off his route. Bryant dished off, only to have the pass batted by Stoudemire. The volleyball eventually bounced into Artest's hands, and with only eight seconds on the clock, you wouldn't have blamed 37 if he felt the need to throw up a long deuce. But instead, Ron shuttled the ball to The Mamba, standing 28 feet away from the cup with eight seconds left. Of course, he put it up. And of course he made it. The lesson learned? Kobe is allowed to jack up what could be considered a "crazy shot." Ron Artest is not.